SAM Learning is an online learning platform that aids student understanding. It won the ‘Best Secondary Digital Content Award’ last year, hosts 70 000 activities across 27 subjects and is proven to increase student GCSE grades. Studies have shown that students who use SAM Learning for 10 hours or more are likely to achieve 1 GCSE grade better in 2 subjects as well as a +0.20 increase in their Progress 8 score (they will make more progress between Years 7-11). For these reasons, Bushey Meads subscribes to SAM Learning each year for the benefit of the students. 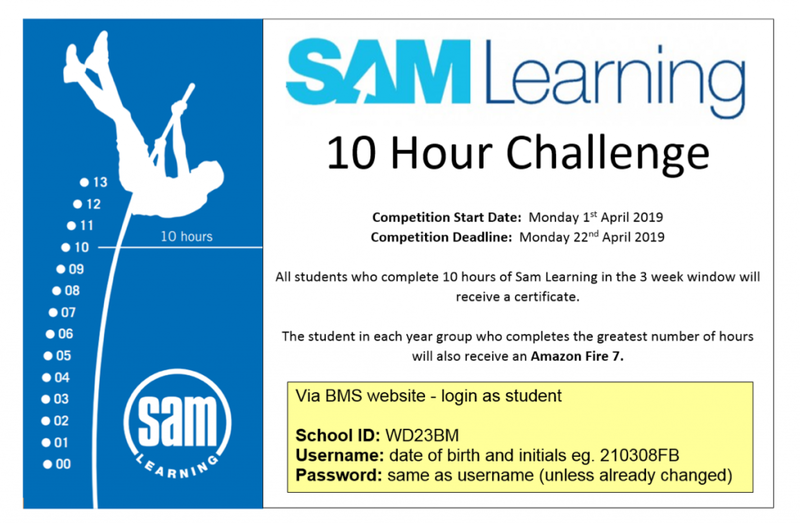 The SAM Learning 10 Hour Challenge starts on Monday and there are some great prizes to be won. During the three week period between Monday 1st April to Monday 22nd April, students have to complete 10 hours of study on SAM Learning – although students do not need to limit their usage to 10 hours. Teachers at BMS will set tasks for students to complete, but students also have the opportunity to find their own tasks to do. Please therefore encourage your child to complete the SAM Learning 10 Hour Challenge. If your child completed one hour per day over the course of the three weeks, they would accumulate 21 hours. If they confined their usage to just one hour per day between Monday to Friday over the two week Easter holiday period they would accumulate the 10 hours with very little effort. Thank you in advance for your support and I look forward to giving out hundreds of certificates – as well as an Amazon Fire 7 to six lucky students.